The Huawei Mate 20 is an excellent handset packed with lots of technology at a reasonable price. Select your desired options to find the best Huawei Mate 20 deals for you. Leading mobile phone manufacturer Huawei has a reputation built on stunning handset after stunning handset. The South Korean company have earned a reputation as one of the three leading companies when it comes to building the best high-end phones. They seem to have a natural understanding of what customers want and providing seems easy with hit after hit to their name. 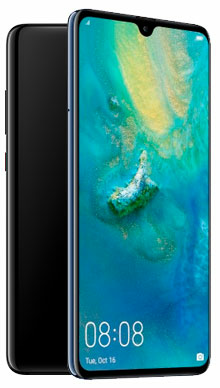 This year saw the launch of the Mate series, three handsets that all offer a similar performance with differing price tags, from the Huawei Mate 20 Pro sitting proudly as the flagship to the Huawei Mate 20 Lite at the bottom with the smaller price tag with a trade-off being a slight cut down performance. In the middle, we find the Huawei Mate 20 which could be the perfect selection for many users. Huawei makes stunning handsets, and the Mate series is no exception. Of course, all three handsets are similar, and the Mate 20 has a high-end look that feels amazing to hold. The design is infinity based edge to edge with the smallest of teardrop cutouts at the top for the front-facing camera. The handset is super shiny and looks fantastic, and you can choose from three colours for the Huawei Mate 20, traditional black, Midnight (blue) and Twilight (darker blue/purple), all of which are stunning to look at. 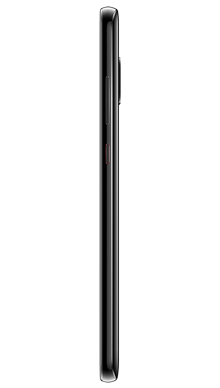 This is larger than the Mate 20 Pro, but only just and measures 6.53 inches, pushing the handset back towards the phablet end of the market. Bigger handsets have gained in popularity due to the film streaming and game playing markets that have opened up in the mobile world. The screen itself is a TFT LCD screen which is typical for a cutdown handset, but to be fair it is still a stunning performance with FHD+ 2244 x 1080 resolution and 381 PPI, so if movies or games are your thing you are in for a visual treat here. On the rear of the handset, you will find the fingerprint scanner, which is colour coded to the handset and blends well. This handset still retains the standard 3.5mm headphone jack which is welcome news for many who love this feature. Also on the rear of the headset, you will not a hefty triple camera set up with is similar to that on the Pro, but with a few performance differences which will discuss later. We know that Huawei nail things like audio with consistency and this is no exception. The speakers are powerful enough to watch a movie in a quiet room comfortably and the headphones experience is first rate. Of course, you have the option to use Bluetooth even with the headphone jack and the sound quality is crisp and clear. So as mentioned the Huawei Mate 20 features the same triple set up as the other handsets in the range. 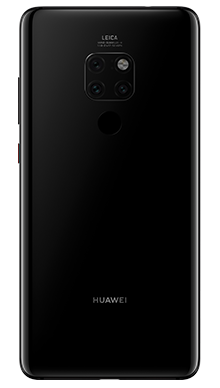 Huawei partner with Leica for their phone camera hardware, so again you will find three Leica lens, the difference being that the resolution is slightly lower on all of them. However, do not let that put you off because this is still way more photographic power than most handset and features the following: 12 MP (Wide Angle Lens, f/1.8 aperture), 16 MP (Ultra Wide Angle Lens, f/2.2 aperture) and an 8 MP (Telephoto, f/2.4 aperture). With the smart supporting software inside this is still more than enough power to take shots to rival a professional high street camera. The Mate series of handsets is all about Octa-core technology, and this is no exception, featuring the Kirin 980 chipset which is hugely powerful we see 2 x Cortex-A76 Based 2.6 GHz + 2 x Cortex-A76 Based 1.92 GHz + 4 x Cortex-A55 1.8 GHz. Being an Android-based handset, it comes as no surprise that this handset features Android 9 Pie and this is overlaid with the Huawei skin, EMUI 9.0 which changes some of the functionality but is still pleasing to use. There are two options for memory and storage; you can choose the 128GB of ROM with either 4GB or 8GB of RAM. Both handsets have a removable memory card, and this can expand the memory to 256GB which is pretty impressive for most users. Huawei prides itself on fast charging, and this handset has a fast charging lead included, and of course, this handset offers wireless charging capability but, wireless is never as fast as cable on any handsets. The Mate 20 also comes with the latest Huawei feature; this handset has two-way charging meaning that any wireless charging device can be placed on the back of the handset and draw power from it. There is no doubt that this is another Huawei success story. The purpose of offering more than one incarnation of their handset has always been to ensure that the market reach is as broad as possible as all three versions in the Mate series will have different price tags. 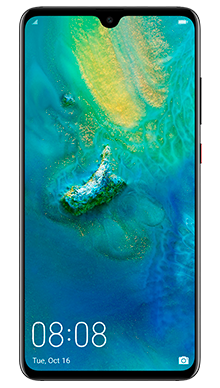 The Huawei Mate 20 is going to be a hugely popular option as it is packed with features and the costs are reasonable. We pride ourselves on being able to offer a vast range of deals on every handset that we have on the shelves, and the Huawei Mate 20 is no exception. Our team have been hard at work hunting for the best deals they can find, and we are delighted with the range they have created for you. Here at Fonehouse, we have exclusive partnerships with Vodafone and EE because we want to ensure we are offering our customers the best in network performance as well as securing the best prices, and where possible a range of free gifts from the network provider. 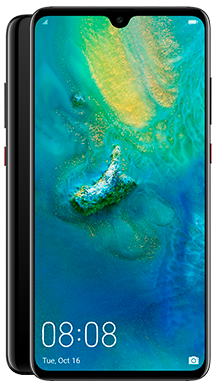 If you think that the Huawei Mate 20 might be the handset for you, then why not get in touch with our customer service team on 0333 900 1133 and they will be delighted to get your handset winging its way to you today.